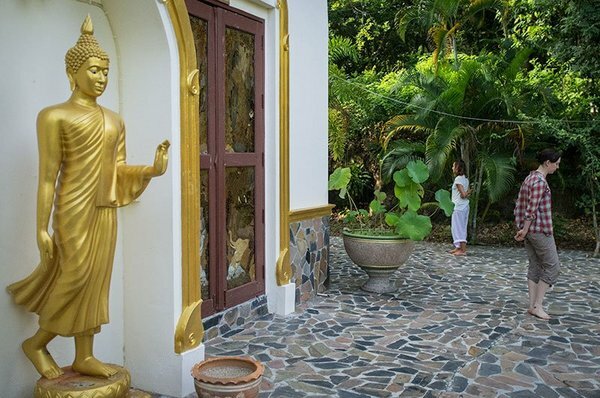 Insight meditation retreats are offered at Khao Tham Insight Meditation Center in the beautiful forested hills above Baan Tai, on Koh PhaNgan, Thailand. The retreats are taught and managed by experienced meditation teachers at no charge. You are welcome to come and meditate at Khao Tham any time. and facilitated by Khun Tookata Sookkasem. See schedule below Please contact Tookata for information about all retreats and the Retreat Center. Khao Tham will close indefinitely starting June 2019. More: Just about everything you want to know about the retreats is on this website, on the Retreat and Practices pages, and their sub-pages — including many of your frequently-asked questions! To know the current schedule: You can see the schedule below, subscribe to the site newsfeed, check our Updates page, follow @KowThamCenter at Twitter.com[?] — or just check back at this website. Registration: There is no online or pre-registration. You must register in person at the Khao Tham Center from 8:30am-4.00pm on the first day of the retreat. Donation: All teachings and guidance are given by our teachers at no charge. However the food and supply shops are not so generous, so we must request a donation of Bt 5,000 to cover the costs of your physical needs for the ten days of retreat. Go to the daily schedule of the 7-day silent retreat. Learn about the Khao Tham rules and regulations, and about preparing for retreat.